we have been supporting community and youth projects in Greenfield and Southern Franklin County for over 90 years. In the past decade we have supported The Greenfield Health Camp (Camp KeeWanee) financially, donating close to $9000 each year for scholarships, reapairs and maintenance and general support. 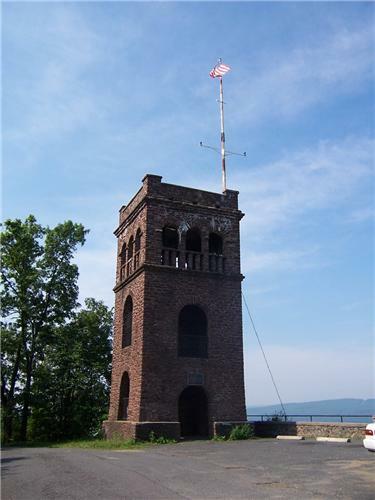 In this decade we raised funds and coordinated the rebuilding of the flag pole on top of Poet’ Seat Tower. The pole had become unsafe and it was no longer going to be possible to string holiday lights. As long as we were replacing the pole we decided to replace it with a larger one that would hold a larger flag. Poet’s Seat Tower before we replaced the pole. When a local friend, Jed McColgan, was deployed to Baghdad, Iraq, we organized a collection of comfort items and reading material. In the end we shipped over 20 boxes to Jed’s unit to help them get through the holidays away from home. In the last few years we’ve partnered with the Franklin County Community Meals Program and provide three meals per year at the Second Congregational Church. We feed as many as eighty people at each meal. Steve Chamberlin, Dan Gagaris and Lisa McKenna preparing a meal. we assisted with the building of the new play structure at Beacon Field. We worked with the town and PTO’s to build play structures. In our eighth decade we contributed financially and with numerous “man-hours” to physically build the play structures at North Parish School and Green River School. It was in this decade that we started our Bicycle Rodeos. The Kiwanis Pediatric Trauma Institute at Tufts Floating Hospital in Boston developed the program. Kiwanis Clubs throughout New England started promoting bicycle safety, and the program is now international. The Greenfield Kiwanis Club has given away more than 3000 helmets in Greenfield, South Deerfield, Turners Falls and Whately since the inception of our local program. is featured on the Tufts Floating Hospital Web Site. 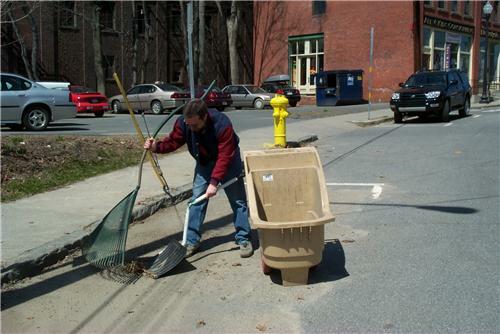 Dave Taylor cleaning up at Miles Street during a clean up day. This was also the decade when we received a sizable endowment that permits us to award $10,000 in scholarships to GHS graduates. Funds were donated in the name of William Carlson, a former Greenfield Kiwanian. In the mid 1990’s we donated funds and contributed hundreds of work hours to build the play structures at North Parish and Green River Schools. This is also the decade when we began our Reading is Fundamental programs. 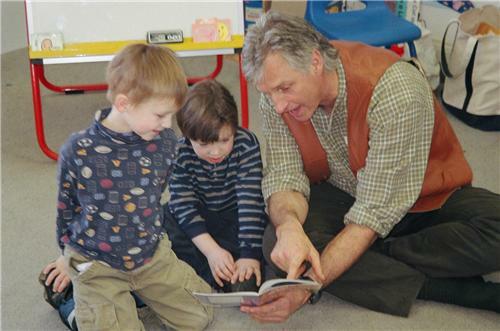 We read two to three times each at as many as seven pre-schools in Greenfield, Turners Falls and South Deerfield. We give out as many as 500 books annually. In our seventh decade we started spending time on playgrounds throughout the Greenfield School System. We participated in the fund raising and physical construction of the 4-Corners School Play Structure. This is also the decade when women joined Kiwanis. In 1987, at the Kiwanis International Convention, women were voted to be admitted membership. Our first female member, Karen Taylor. Today our membership is 20% women. Pediatric Ward at Franklin Hospital. In our fourth decade we continued our building of the Greenfield Health Camp, including $3000 to build a permanend 25 x 50 Concrete Pool and a Director’s House. We also brought all of the campers to the circus one year. Additionally, we paid $3000 toward the construction of the YMCA’s Camp Apex Pool. In our third decade we continued our work with Greenfield Health Camp, including construction of another building and the first swimming pool. We also performed major repairs including stairs, foundations and electrical work. During this time we also donated $1800 toward the Pediatric Ward at Franklin Hospital, today knows as Baystate Franklin Medical Center. In our beginning years we were strong supporters of the GHS Band and purchased Music and Uniforms. We sent the band to Worcester for a State Tournament, and we hosted a clam bake for over 160 band members. Over multiple years we either supported or purchased the Municipal Christmas Tree on the town common. Eventually we decided to acquire and plant a Permanent Tree for the town. We purchased the Nash’s Mill Pond from George Lunt, repaired the dam, and sold it to the Town for $1. We believe this to be the current Greenfield Recreation Department Swimming Pool. It was in these beginning years that we were involved in the formation of the Greenfield Health Camp – today commonly known as Camp Keewanee. It started with a financial donation to combat tuberculosis. Next we supported the Kiwanis Ladies Committee relative to the New York Tribune’s Fresh Air Children. Beginning 1925 we incurred much of the expense related to the construction of the camp, including at least 6 buildings. The expenses were so great that individual club members were approached for donations to cover expenses that the club was unable to meet. It was during this time that we decided to hold all of our summer meetings out at the camp.